Copenhagen is going to the be the first large city in Scandinavia to install intelligent traffic lights at all intersections. The old lights and system are 35 years old so it is high time to modernise. The primary focus is on getting bicycle traffic and public transport to flow better, but the system will also benefit last century technology like cars. 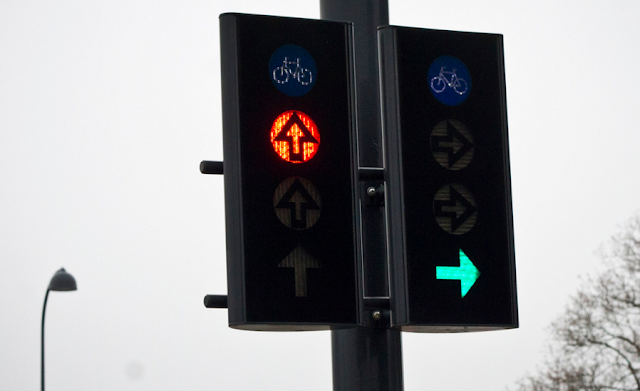 The City of Copenhagen has invested in 380 new, intelligent traffic signals. It is estimated that bus passengers will save between 5 and 20% on their travel time. Cyclists can look forward to a 10% improvement in theirs. The traffic signals will be online and allow for better green waves and a general improvement in controlling the traffic in Copenhagen. The signals are a part of a 47 millioner kroner (€6.2 million) package aimed at making Copenhagen's traffic system more digital and intelligent. All the main arteries leading to the city centre have green waves for bicycles - ride 20 km/h and you don't have to put your foot down the whole ride to the city center and home again in the afternoon. There have already been pilot projects to improve this technology, with sensors "reading" how many cyclists are approaching an intersection. If five or more are bunched together, the light will stay green to allow them to roll through. The Mayor for the Traffic and Environmental Administration, Morten Kabell, says, "In short, these systems will ensure traffic that flows better so that as many people as possible can saave time in the greenest possible way. It means that Copenhageners won't waste time on their way to and from work and that is good business. Copenhagen will be a laboratory where we develop new solutions." The City of Copenhagen is also working hard on reversing one of the oldest paradigms in traffic - one that has dominated cities for many decades. Whenever a suggestion is made to light signals or infrastructure, the baseline question has been "how will that affect travel times for motorists?" If the answer was a negative one, the idea risked getting killed off. The City now wants to make the baseline question "how will it affect the travel times for bicycles?" If it has a negative effect on bicycle traffic and travel times, the idea will be viewed as less positive. Car traffic will be sent farther down the hierarchy in this new paradigm. Where it belongs. It requires a great deal of work to redesign the entire paradigm, but if and when Copenhagen pulls it off, we can look forward to a sea change in urban planning and traffic management.